I fell in love with a gilt linen fabric, and thought it was the perfect excuse to make a pair of front and back lacing linen stays that were both practical and pretty. 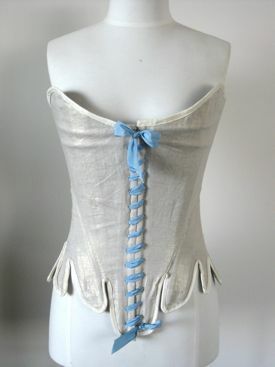 The stays were very roughly based on the 1750s stay pattern from Jill Salen’s Corsets: Historical Patterns and Techniques. I altered the pattern pieces to suit a 1770s date, and used a 1770s half-boned boning layout with horizontal bust support bones, rather than the fully boned layout of the Salen stays. Sewing the stays was a bit of a trial. Every small, silly thing that could go wrong, did. They were variously called ill-begotten, evil, and the Silver Stays of Doom. Gilt linen outer, brown linen support fabric, blue cotton lining, kid leather binding, rayon ribbons, plastic whalebone (cable ties) to bone. Love your website, I refer to it often when sewing historical garments. Question regarding the use of cable ties, do you use these because they are a close substitution for whalebone or other reasons? I’d like to try a pair of 1750s stays from Salen’s Corsets, but using steel seems like a waste and would make the garment extremely heavy. Your example used cable ties, did you find them suitable?